With the increasing use of composites as well as more stringent Health & Safety and environmental requirements correct extraction of fumes and dust is key to best practice. However, 80% of extraction equipment is highly ineffective because it is either poorly specified or incorrectly used. Any company providing local extraction ventilation (LEV) equipment must risk assess the activity to ensure it is providing the correct equipment. We also provide turnkey solutions with our range of extraction benches and portable extraction that provides solutions where other equipment does not. We used our process knowledge and expertise to design a dust and fume extraction bench that can scrub contaminated air of dust and fumes so it can recirculate clean air into the room so existing ventilation and pressurisation is not effected. Our benches have been fully analysed, tested and certified as capable of use with solvents without the need for ATEX fans/motors. This has been confirmed SIRA (a hazardous area certification body) and we now sell these extraction tables to the composites industry. We use these ourselves and they are suitable for training, schools, colleges, universities, R&D labs, small/flexible production and composite repair facilities. The performance of air tools with on-tool extraction shrouds fitted is effected by the type of dust extraction unit it is used with. Some look similar but often do not perform the same. Getting the right levels of vacuum volume and vacuum pressure are key to performance. 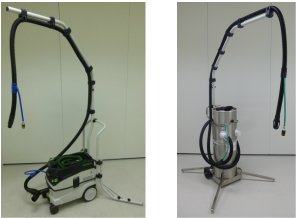 We are composite experts who actually use these portable extraction units and know how to set them up for specific tools. Our extraction units are supplied in the configuration we would use them.